Discussion in 'Norton Commando Motorcycles (Classic)' started by Fullauto, Oct 23, 2017. I have ridden an excellent Manx Norton. My 850 is much faster. Really? I have never ridden a Manx but I was under the impression that they could hit 140mph which I didn't think any relatively stock Commando could manage. Jim, you mentioned "restricted peashooters" Does that mean that all peashooters are restrictive or just certain ones. Are the generally available ones - seems like Emgo is a common brand as is the AN "Norton" logo peashooters - considered restrictive? peashooters. Maybe they still are. IIRC, the restrictive peashooters were used on the Mk2a and Mk3 models with the plastic airbox. Part 18 on the diagram is a "choke" like ring that I think was to deal to noise restrictions. The restricted peashooters were just the late factory peashooters. The hole in the end was about the size of your thumb. They were used with a crossover exhaust. The restrictor was not removable. [without grinding tools] Not like the interstate mufflers. As far as I know all the aftermarket peashooters were large diameter all the way through so they are not restricted..
What I would be keen to see if it is out there is a dyno result from a 68-69 Commando with the early silencers fitted. If you still have the lightweight valve springs installed you might want to see what happens if you increase the spring pressure. Usually the only sign you will see with low spring pressure is the power goes flat early. The Fullauto head can easily make power past 6500 if everything else is correct. Not so much lightweight, just light on the seat. They are standard springs, but with the lift on the cam I will need a spring with a lower rate otherwise the top end will be too high. Not sure how I can get around it, or if springs with the lower rate I would need exist. Might send a spare head up to Steve and see if he can fit larger valves, the end of the day, I want it to be a smooth road bike with a nice, but not massive increase in power. You just about make out the power curves here, sadly it does not show the torque, you could eat you dinner of the torque curve to go with the blue result. The fueling was the interest to Amal, mine is about right for max torque, and this is with the needle on the middle groove. What air filter setup are you using ? I note you are using 19 pilots (a fairly recent revision to the std setting). Tony and I both run a single K&N filter on our MK3's , his is fitted with pea shooters and I use RGM's straight through balck cap reps. Both were positively asthmatic on std premier jetting, only when we got to 260 mains, richer Needles and 19 pilots and float levels set evenly, did normal service return. Mr. Fullauto, where was yours done? I went to Russell at Dyno Time in Wangara in Western Australia. Would be nice to know for comparison. The rest of the engine seems original but I never had it apart so I don't know for sure. Reason why I did the Dyno run is because I am about to rebuilt the engine. I am planning to do a few mods (camshaft, compression, porting etc.) so I wanted to have a before and after comparison just out of curiosity. 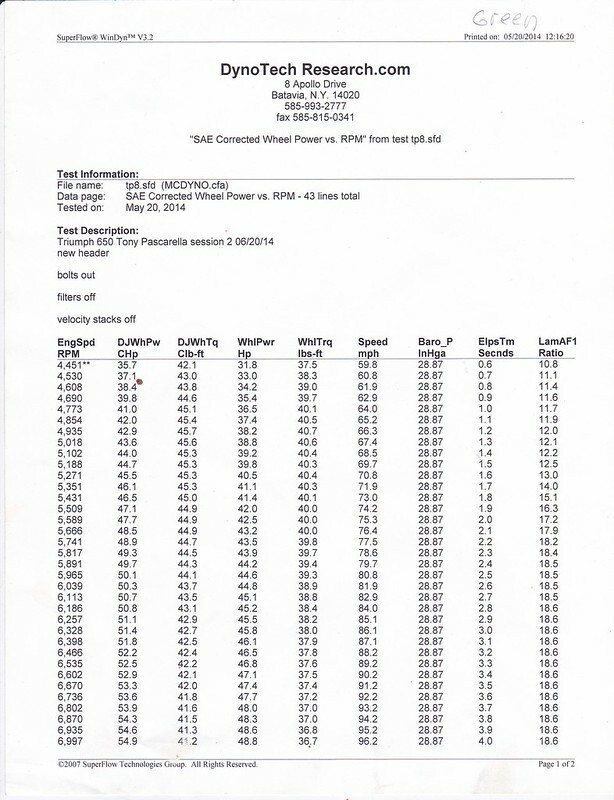 The AFR chart showed that the engine runs lean up to 3000rpm, then too rich. So with the right carb adjustment I may have achieved a slightely better result. I am a bit surprised that my engine is relatively close to Mr. Fullautos, with the nice head and the PW3 I would have expected a bigger difference. Anyway, I will update in a few months when the engine work is done. If we take the two graphs as gospel, yours appears to be a touch stronger in the middle 4-4.5 rpm and Fullautos is a bit stronger at top. Yep. Russell at Dynotime. I can't believe he still can't spell "Norton". Here's and 850 running rich with a compression plate fitted, FA head, Premiers, plate now removed and needles dropped one notch, so most probably running a little better than what was obtained below. 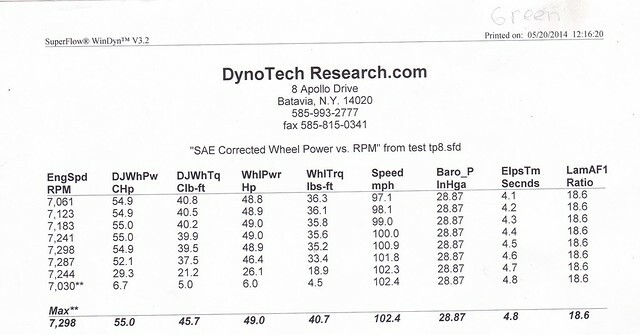 Dynojets are supposed to be a bit more "generous" in their outputs than Dyno Dynamics aren't they? Every one on this forum is eccentric and you spend plenty of time here! Not to mention the machine...Commando. In a perfect digital world some analog eccentric is refreshing. Katherine, when you say richer needles, do you mean different needles, or putting the stock needles on richer clip positions? My above trace is with 'as delivered' early 850 premiers with the needle in the middle groove, as can be seen it is in tolerance but very close to being to over rich, I have since lowered the needle and the plugs are a nice light brown. Clearly there is scope with a standard carb to get it to deliver more. The cam is PW4, radiused followers and valves were standard size. The dyno tester was also impressed with the carbs response to gear changes when he was doing the run, even compared to FI systems he sees, which is nearly all the time. I reckon you’d have over 50 horses, with little or no detriment to torque, if you fitted twin carbs. Admittedly I have not read all the posts, but if you do have a single carbie, you will increase the bottom end rev range, meaning you will be able to ride in top gear a full 8- 10 mph lower if you fit reducing sleeves into each inlet port-don’t ask me how I know. . . .
Just for comparison although you cannot compare different dyno readings is my 650 Triumph..This is not a radial engine ,10.5 compression, Sifton 390 cams, Mikuni 34mm flat slides, raised intake port floors and 1-1/2 x 34 inch straight pipes...This naked frame modified production bike was timed at 133.2 MPH at the 1-1/2 mile land speed track in Loring Maine .